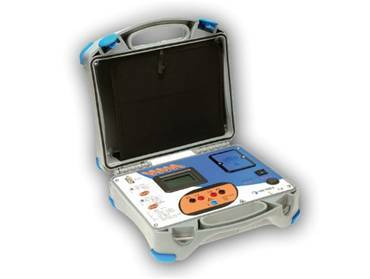 Independence: instrument is designed to work independently or in conjunction with: MI 2086 Eurotest 61557, MI 3101 EurotestAT, MI 3105 EurotestXA and MI 3321 MultiServicerXA. Range widening: adapts the instruments to read from 0.1 mΩ up to 19.99 Ω.
Multi-system testing: works on both single phase and 3-phase systems (110 V to 440 V). IPSC and IPFC calculation: IPSC and IPFC readings calculated up to 400 kA. Comfortable carrying: all the accessories are put in the strong, rugged, durable case of the instrument. LCD: Built-in LCD for standalone measurements. Progressive Technology & Services L.L.C. Copyright © 2018. Progressive Technology & Services LLC. All Rights Reserved.